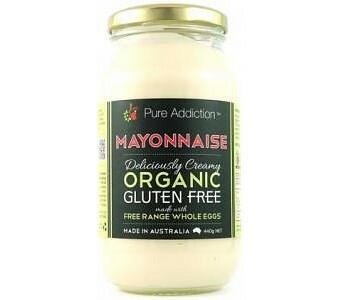 Ozganics Pure Addiction Organic Mayonnaise is deliciously thick, rich and creamy, with a slight sweet acidic mustard note. This well balanced creamy mayonnaise is made from Organic Free Range Whole Eggs. The High Oleic Sunflower oil that is used is both certified organic and cold pressed, therefore it does not contain any chemicals that are commonly used for extraction. No artificial colours, flavours or preservatives Made with Organic Free Range Eggs Australian Certified Organic Australian made product from an Australian owned company Ingredients: Organic High Oleic Sunflower Oil, Water, Organic Free Range Egg (7%), Organic Sugar, Salt, Lemon Juice, Food Acid (Acetic Acid), Organic Mustard, Xanthan Gum, Spice Extract, Natural Flavour, Herb Extract. Note: Contains Egg.